Diwali, the festival of lights, celebrates the abundance of autumn harvest and is dedicated to various gods and goddesses. The festival also marks an important date in the Indian calendar, as the North Indian kingdom of Avadha has celebrated this as the last day of Lord Rama’s long exile of fourteen years. As the citizens of Ayodhya eagerly awaited their beloved prince’s return, they lit thousands of lamps to guide his flying vimana to their city. The darkest night of the year gave way to a glorious morning as Rama returned with his wife and brothers to his ancestral kingdom of Avadha. Diwali also celebrates the gracious nature of the three goddesses, Lakshmi, Kali and Saraswati. Dhanteras (two days before Diwali) is dedicated to Lakshmi, whose blessings are essential for a prosperous, fruitful and peaceful life. Kali-Chudash (the day before Diwali) is dedicated to Maha Kali whose strength we seek to maintain the wealth we have. Strength, physical, mental and spiritual, is essential for all of us to lead a happy life. Diwali itself is dedicated to goddess Saraswati. Knowledge is the ultimate wealth, for it cannot be stolen from you; it is also the ultimate strength, for it often defeats brute force. Goddess Lakshmi : The Goddess of wealth, Lakshmi was incarnated on the new moon day (amaavasyaa) of the Kartik month during the churning of the ocean (samudra-manthan), hence the association of Diwali with Lakshmi. Vishnu Rescued Lakshmi: On this very day, Lord Vishnu in his fifth incarnation as Vaman-avtaara rescued Lakshmi from the prison of King Bali and this is another reason of worshipping Ma Larkshmi on Diwali. Krishna Killed Narakaasur: On the day preceding Diwali, Lord Krishna killed the demon king Narakaasur and rescued 16,000 women from his captivity. The celebration of this freedom went on for two days including the Diwali day as a victory festival. The Return of the Pandavas: According to the great epic ‘Mahabharata’, it was ‘Kartik Amavashya’ when the Pandavas appeared from their 12 years of banishment as a result of their defeat in the hands of the Kauravas at the game of dice (gambling). The subjects who loved the Pandavas celebrated the day by lighting the earthen lamps. The Victory of Rama: According to the epic ‘Ramayana’, it was the new moon day of Kartik when Lord Ram, Ma Sita and Lakshman returned to Ayodhya after vanquishing Ravana and conquering Lanka. 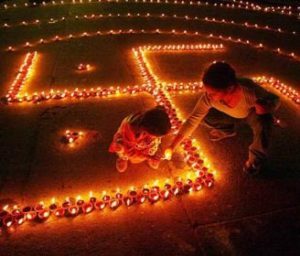 The citizens of Ayodhya decorated the entire city with the earthen lamps and illuminated it like never before. Coronation of Vikramaditya: One of the greatest Hindu King Vikramaditya was coronated on the Diwali day, hence Diwali became a historical event as well.